With vines growing between 1,000 and 3,000 meters above sea level, Salta, Catamarca, and Tucumán make up the famous Calchaquí Valleys. A great varietal character and incredible concentration are the features that make their wines distinguished worldwide. This region is known as one of the most picturesque places in Argentina. 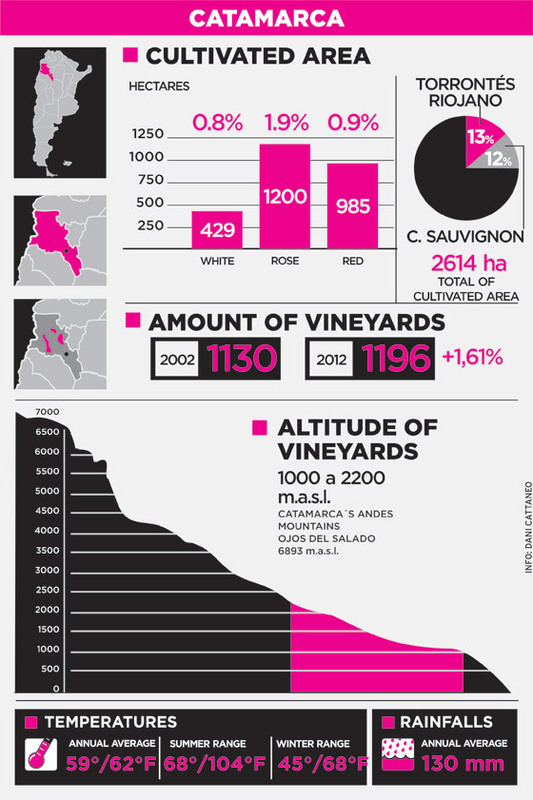 Within its wine context, Cafayate stands out, accounting for 70% of the Valley’s vineyards, with 3,200 cultivated hectares, of which 99% are intended for fine wine-making. Cafayate has excellent landscapes, climate, craft products, typical food, prestigious folk music, and of course, the people that work with passion and love for the terroir. 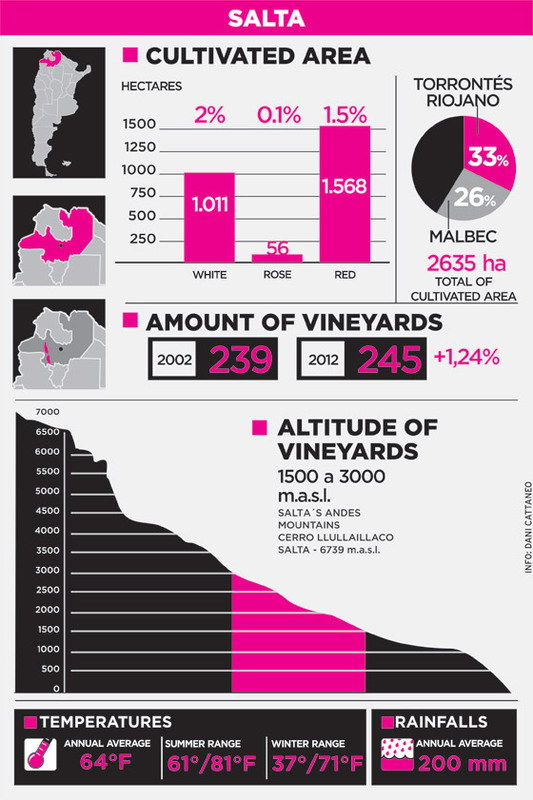 Some of the characteristics that define Salta are its high-altitude vineyards; poor, sandy, deep soils; very high sun exposure; low humidity; and a wide temperature range between day and night. Unlike in other parts of the country, the wines exhibit an incredible personality, aromatic intensity, deep and vibrant colors, and a striking volume on the palate. 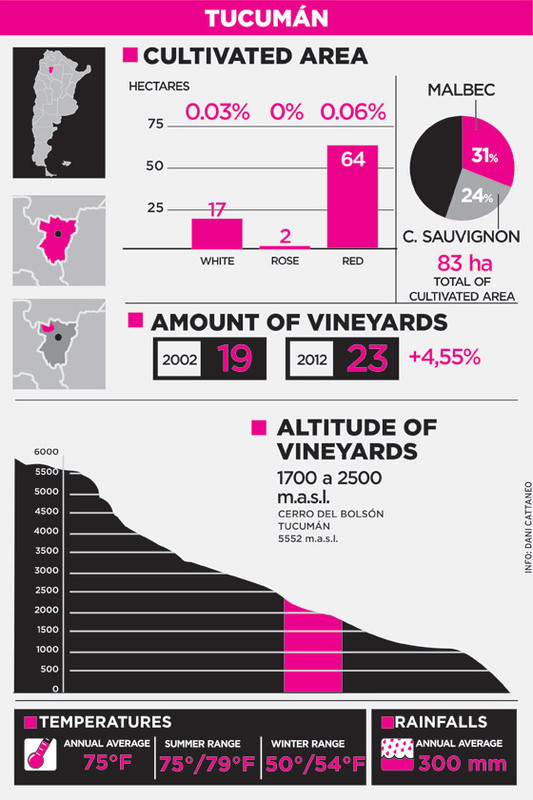 Salta used to be associated only with Torrontés, the emblematic white wine of these Valleys. Nonetheless, other varieties are developing with great expressiveness and it is worthy to note the great potential of Malbec and Tannat. The latter matures very well, reaching an excellent acidity and sourcing a fruity and well-structured wine, with intense color and ripe tannins. The winemaking of this province has been gradually positioned in the domestic and foreign markets, after much research and a restructuring of the market. Most of the grapes come from the central southern area of the Calchaquí Valley, a distance of approximately 50km, between Salta in the north and Catamarca in the south, so Tucumán shares 320km of the geographical Calchaquí Valley (between Abra del Acay and Punta de Balasto). As regards to the terroir, it is a sub-Andean valley blessed by a dry and arid climate. It is cold in winters and warm in summers. It has annual rainfalls of 120mm, one of the driest areas throughout the valley. It has 345 days of sunshine a year, leading to a wide temperature range: 79° F, with an annual average of 61°F (1.39°F / 99°F) and constant winds. The soil of this region is sandy with rugged landscapes, due to the valley slopes and steep mountains. Among the varieties, Torrontés stands out, followed by Malbec, Cabernet Sauvignon, as well as the blends. The wine region of Catamarca stretches out in the oasis of the western valleys of this province. Tinogasta represents 70% of the grape-growing area intended for wine- making and fresh consumption. Other less developed areas of production are Belén, Fiambalá and Santa María. Two of the typical varietal wines of Catamarca are Torrontés Riojano and Cabernet Sauvignon.